Timofey Dolya was born in Moscow in 1993. In 2012, he had graduated with honors the Central Music School at the P. I. Tchaikovsky Moscow State Conservatory (the class of Honoured Artist of the Russian Federation, Professor Andrey Pisarev). In 2017 he has graduated with honors P. I. Tchaikovsky Moscow State Conservatory and he was given the title “The best graduate of 2017” for excellence in education and creative achievements. At present, he is on assistance-trainee at the P. I. Tchaikovsky Moscow State Conservatory (the class of Professor Andrey Pisarev). 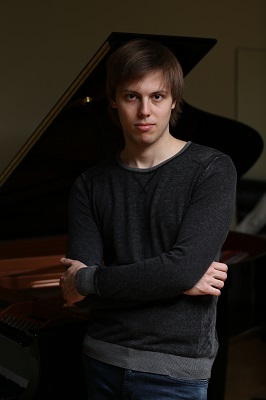 During his studies, Timofey was a prize-winner of numerous international competitions, among which are: Pianale International Academy and Competition – 1st prize and six special prizes (Fulda, Germany, 2016), International Competition in the Memory of Vera Lotar-Shevchenko – 2nd prize (Yekaterinburg, Russia, 2016), Igumnov Competition-Festival – 1st prize and two special prizes (Lipetsk, Russia, 2016), Coimbra World Piano Competition – 2nd prize (Coimbra, Portugal (2016), Markische Musiktage – 1st prize (Eggersdorf, Germany, 2014), Rachmaninov Piano Competition – 2nd prize and special prize (Frankfurt, Germany, 2013) and others. In 2014, Timofey received the grant for summer study in the Aspen Music Festival and School (USA, Colorado). In May 2016, he studied at the Conservatorio Statale di Musica “Gioachino Rossini”, within the framework of exchange study programs fostered by the Italian Embassy in the Russian Federation. In 2014, he received also the grant of the Rector of the P. I. Tchaikovsky Moscow State Conservatory. In addition, he is a holder of the scholarship of the President of the Russian Federation (2016-2017). Timofey Dolya is an active participant of music festivals (Vienna Music Festival in Yekaterinburg, Gradus ad Parnassum, Klavierfestival in Bayreuth, etc.) His performances have taken place in the best concert halls in Moscow. The young pianist has given recitals in Germany, Italy and Spain. He has also performed in numerous musical events in Austria, USA and Japan. Timofey has performed with such symphony orchestras as the Moscow State Symphony Orchestra (Music Director & Chief Conductor Pavel Kogan; Conductor Alexander Sidnev), the Brandenburg State Orchestra (Conductor Ulrich Kern), the Ural Philharmonic Orchestra (Conductor Alexey Dorkin), the Lipetsk Symphony Orchestra (Conductor Konstantin Barkov) and others. Timofey is an artist of KNS Classical and in June 2017, he recorded a CD under the label of KNS Classical. If you are interested in working with Timofey, please get in touch with the EMCY Office. B. Bartok, Suite op.14 J. S.